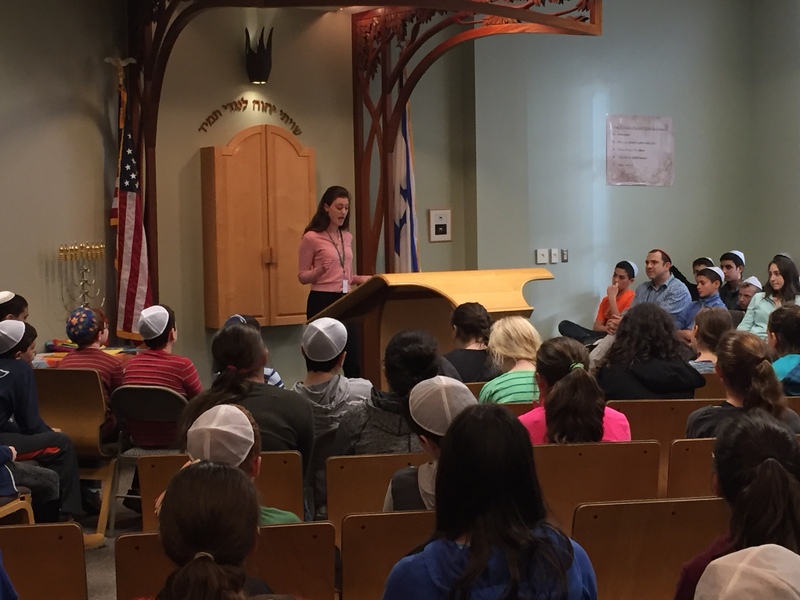 Alumna Sarah Cohen ’07 spoke to Schechter middle school students as part of our Ani Ma’amin speaker series: a forum for guests to share what they believe in. Sarah’s message was one of derech eretz. She spoke about listening to others who hold different views, and suggested that while we might not agree with everyone, we can try to understand. Sarah discussed her most recent position as a field operation organizer for Hillary Clinton’s campaign in Florida. She described the different cultures between southern and northern Florida, and the challenges she faced, including witnessing homes with Confederate flags. Although she felt that this can be off-putting, it was more important to her to be decent and reach out to people. Here is a recent article Sarah published online where she writes more about her experiences on the campaign trail. Schechter is always looking for community members who would be interested in sharing their experiences. If you would like to speak to Schechter students about your experiences and beliefs, please contact Shira Lewin at Shira.Lewin@ssdsboston.org.